I’m currently on paternity leave from work. My daughter, Emily Lorraine Auteri, was born on July 4th. 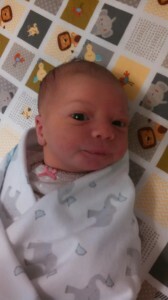 Like our forefathers declaring independence from British rule, Miss Emily declared her independence from my wife’s womb. The picture I included with this post is my favorite photo of her thus far. My father took it. She’s quite the alert baby as you can tell.